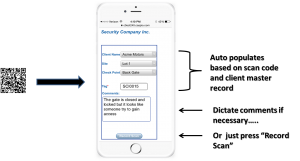 Our security guard management system includes an integrated QR code scanning feature. Security Patrol Track makes scanning checkpoints and receiving scan reports simple! A security guard checkpoint system is necessary to compete in today’s demanding security officer industry. It provides your clients with peace of mind to receive a checkpoint report with events that are time-stamped, and include a satellite photo of where the scan took place. Our system is very user-friendly for you, your officers and your clients. Security Patrol Track makes a portal available for your clients to access their reports which are branded with your company logo and name. Your client’s report lists date, time, checkpoint scanned and a satellite photo. Create your own codes or let us create them for you! Codes can be printed on a variety of media, from paper labels to metal tags. This module completely eliminates the need for a separate, traditional guard tour system. Our system is integrated so scan activity, including scan comments, can be printed as a separate report, or as part of one of the many other activity reports. Our system also supports RFID/NFC technology with the same app. our streamlined and smooth security guard checkpoint system !